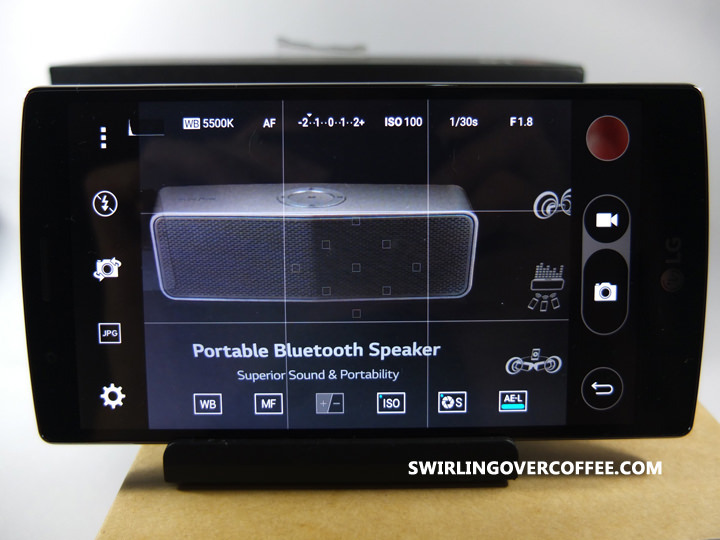 I had a one night stand with the gorgeous LG G4, and at SwirlingOverCoffee, sometimes we kiss and tell. Let’s do this. The LG G3’s crowning features are the gorgeous edge-to-edge display and the shoot-under-any-condition tap-to-capture, laser guided auto focus rear camera. But the G3’s front camera was merely adequate and users awed by the rear camera wanted more control. Also, contrast could be better considering that it frequently got compared with AMOLED screens of competing flagships. The LG G4 addresses these concerns, and more, with a slightly curved display that has improved contrast and color reproduction and less power consumption; and a rear camera that with a bright f/1.8 aperture that’s also capable of manual controls. Optical Image Stabilization, which helps with steady shots in low light, has also been enhanced. Both the plastic and leather variants of the G4 offer improved grippyness compared to its predecessor. The iconic rear keys belong to LG. This started with the LG G2 followed by the LG G Pro 2, then the G3, and now the G4. The design of the G4’s rear keys are actually closer to that of the G Pro 2’s than to that of the G3 (which is good, because that sets both phones apart). A carry over feature of the LG Flex and Flex 2 – the curved display – is now on the LG G4, though the curvature is not as pronounced. It looks and feels just right. Somehow the curvature (plus the luscious leather back) is ergonomically / anatomically agreeing with your hand when you hold it, and feels just right when you place the phone close your face when you make a call. It looks great, and maybe even intimate, when you’re watching a video. That leather back plus the curvature all the more begs your hand to caress the phone. When your phone feels that good in your hand and looks magnificent and its display is this gorgeous and the pictures it takes are superb, you ask yourself why isn’t this phone mine right now? Not even the metal-framed, round-cornered S6 has this much class. Actually, no phone I’ve handled has this much class. The things I love about the G3 rear camera – magnificent food shots, exposure-balanced against-the-light scenes, dynamic range capable of drama, low light interior shots to brag about, spot on metering, concert-photography readiness – they’re all in the G4, but better – the f./1.8 aperture allows more light so low light scenes are clearer. Color accuracy is also better. That’s important when you’re shooting close up product shots and uploading them for prospective buyers to see. Here’s where enthusiasts are going to have fun. Manual mode. Remember though that I’m only getting to learn full manual control on my own mirrorless camera. So don’t judge the manual-tweaked shots as the best representation of what the LG G4 can do. I’m sure I can do better if I had more time with the G4, instead of an overnight experience. I love a phone that captures the dimly lit as well the bright parts. The G4’s improved aperture, I think, greatly improves usable photos even when digitally zoomed. Imagine having more usable concert shots. Now you won’t have to settle for pictures of your crush from afar. People, if I had a selfie model available 24/7 I would not be in this shot. So please. The improved front camera is a welcome change: what a difference 8MP makes. Bokeh, or defocused background, is achievable without tweaking anything. These would be great for portraits. The LG G4 is not a benchmark test beast. Neither were the G3 or G2 and both were hailed as incredible phones. LG is sticking to their guns in making users happy with the experience of using an LG flagship, as opposed to bragging about specs and benchmarks and, “Mama, look how many apps I can run and switch between without slowing down my phone?”. Given how happy I am with the LG G4, arguments involving value for money and feature to price considerations sound like a distant murmur, like a fragment of yesterday’s dream. This is one gorgeous phone you will be proud to own. I know I am. And it’s not even mine. And this isn’t even a full review.